[Template fetch failed for https://www.limspec.com/index.php/Template:Specification_CH_0924142_Data_range?action=render: HTTP 500]HealthCloudPOL will flag any results that fall outside value ranges that you define for any parameter. You can define ranges (Limits), as well as any internal warning limits or specifications, using the Limits function in the Test Parameter Details screen. 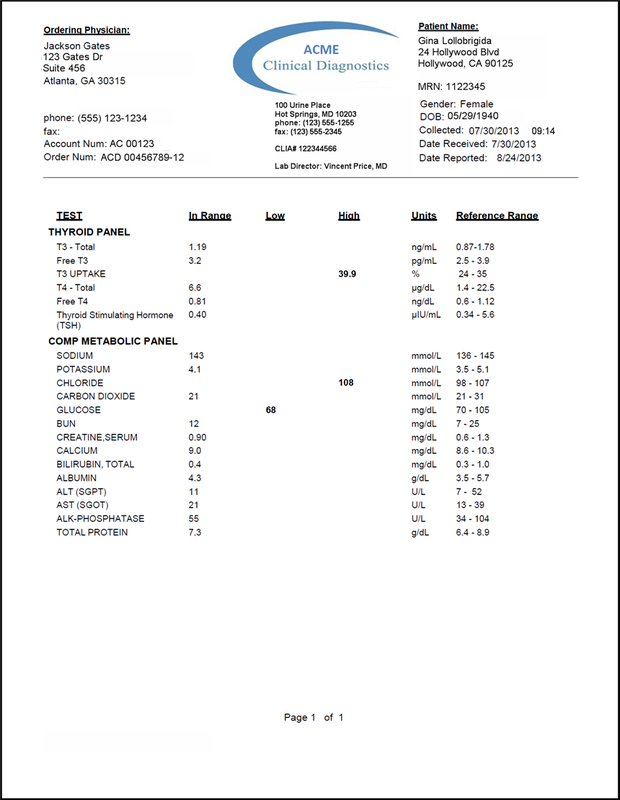 The ranges specified for each test parameter are displayed on the Patient Report, as well as the result and whether that result is high, low or in range. The Limit Type list is modifiable (see Picklist management). You may have as many types of limits and limit sets as you like. Additionally, in the Data Entry screen, any results entered that are outside of the specified range are immediately flagged for the user, with a color code and icon displayed. [Template fetch failed for https://www.limspec.com/index.php/Template:Specification_SLS0712_Narrative-based_tests?action=render: HTTP 500]HealthCloudPOL supports any types of values for test results, including numeric, narrative/word or symbols, as well as files (e.g. images), and notes can also be added. And also, default choices (present, not present, ND or a numeric value etc.) 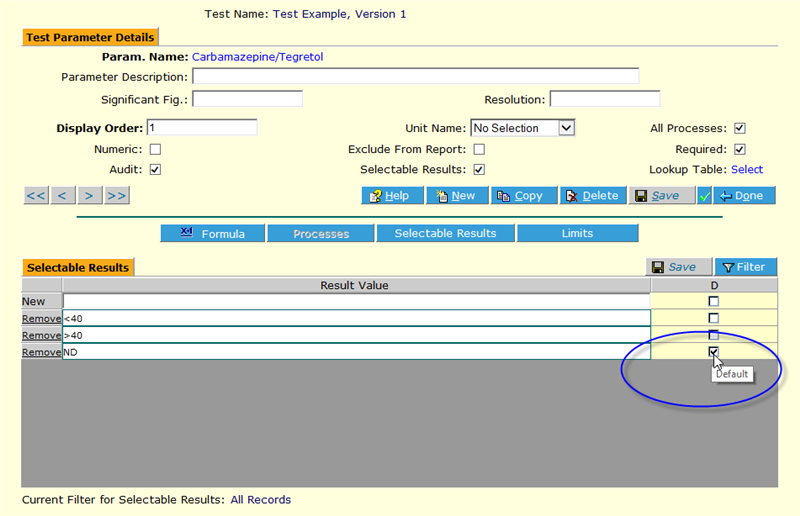 may be defined and offered as selectable result values from picklists to expedite data entry. The procedure for creating a test, including all parameter result value options, is explained in detailed, step-by-step fashion in the HealthCloudPOL manual Test Management section. [Template fetch failed for https://www.limspec.com/index.php/Template:Specification_SLS0710_Non-narrative_values?action=render: HTTP 500]HealthCloudPOL supports any types of values for test results, including numeric, narrative/word or symbols, as well as files (e.g. images), and notes can also be added. And also, default choices (present, not present, ND or a numeric value etc.) may be defined and offered as selectable result values from picklists to expedite data entry. [Template fetch failed for https://www.limspec.com/index.php/Template:Specification_POL_FF_A0010_Approve-Rerun-Cancel?action=render: HTTP 500]Authorized users can review and approve all of the data from the data entry screen. They may also enter any comments about a particular result in the batch. They may also approve, send back for re-run or cancel a result from the Batch Summary screen. Approving the data will drop it from the list. This is accomplished by clicking the “no action” line once to highlight the results green. Clicking them a second time will turn them yellow which will automatically create new sample test run for the batch. Clicking a third time will highlight the data red. This will cancel the results, which will require a new sample. Comments may be added when canceling as well. Canceling results does not delete the data from the database, which may be viewed by authorized users in the Audit Trail screen. If the sample requires a second run for dilution, the system displays the results from both runs. This allows the user to determine which result is to be reported, and that will be the one they approve. The one that they cancel will not be reported. 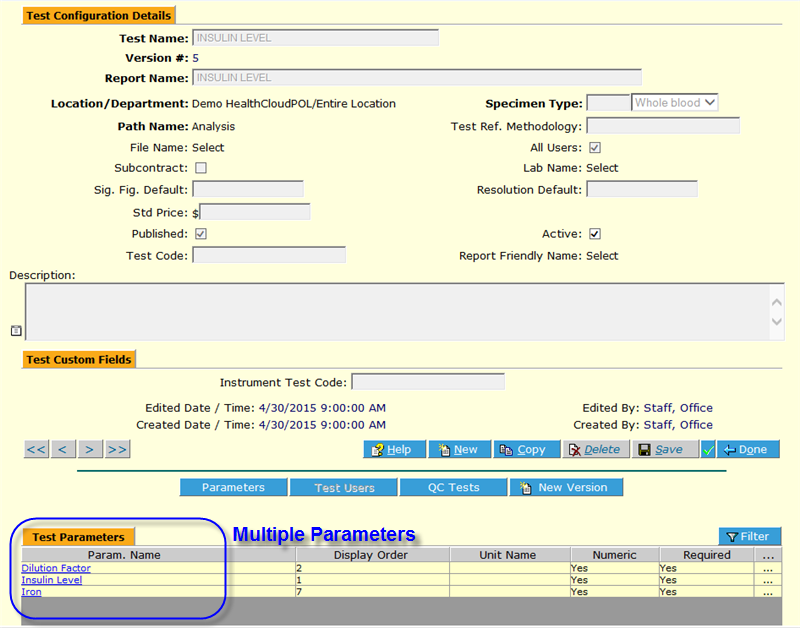 These processes are detailed in the HealthCloudPOL manual, in the Test Management section. [Template fetch failed for https://www.limspec.com/index.php/Template:Specification_SLS0711_Multi-component_tests?action=render: HTTP 500]Tests, or assays, in HealthCloudPOL may contain as many analytes/parameters as you like – each with its own set of limit ranges, rounding rules, units, value specifications (numeric/non-numeric, selectable, etc.) and more. And in fact, tests can also be grouped into panels, with a number of common panels already set up in the LIS as delivered. [Template fetch failed for https://www.limspec.com/index.php/Template:Specification_SLS0709_Default_input_values?action=render: HTTP 500]Both the free Basic and subscription Standard HealthCloudPOL editions from LabLynx, Inc., delivered with a default set of standard assays and panels, also include the ability to completely define as many new ones as you like – to your own specifications. That includes the ability to set default values for each parameter if there are selectable results. 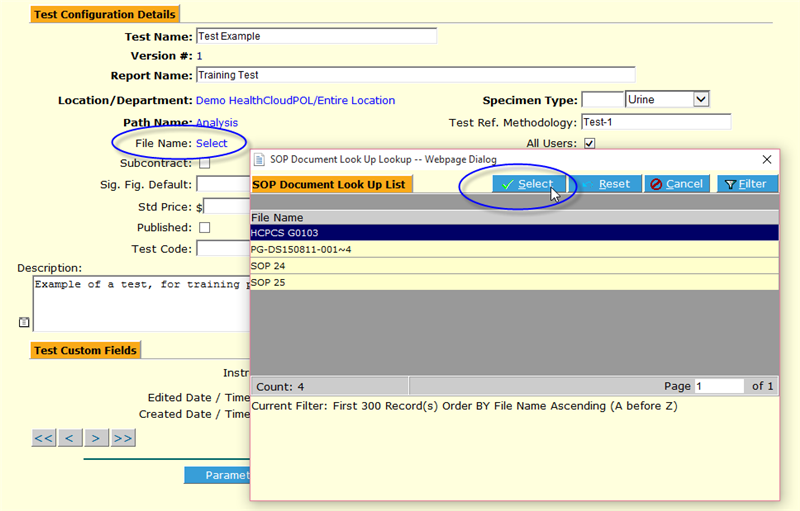 [Template fetch failed for https://www.limspec.com/index.php/Template:Specification_SLS0437_SOP_access_and_version_control?action=render: HTTP 500]SOPs and in fact any kinds of documents are easily uploaded, stored and accessed by authorized users in HealthCloudPOL, in a number of places. Any documents, including SOPs, MSDSs, Methods, Orders, Maintenance receipts, etc. can be uploaded to the LIS and accessed in the Document Record Management section. For the Physician Office Laboratory, as with any clinical lab, this is especially useful for keeping track of CLIA, HIPAA, CAP, CLSI and other standards, regulations and guidelines, as well as SOPs/methods and any training records, helping you stay compliant. You can also upload any files of any kind to various screens in the LIS, such as the Order screen (e.g. requisitions/orders), Patient Management (any files related to patients, physicians/practitioners, insurance companies, etc. ), Lab Inventory (MSDS, orders, receipts, inventory records, etc,) or User Management (digital signature).